When meeting someone for the first time, your smile is likely what they’ll notice before anything else. If this doesn’t sound like good news, it may be time to explore a cosmetic makeover with First Line Dental’s experienced team! We offer several different services that are specifically designed to elevate the appearance and confidence of teeth while keeping dental health as a top priority. We can’t wait to help you design the treatment plan that best fits your personal goals and preferences! Contact us today to schedule a free consultation. Why Choose First line dental for Cosmetic Dentistry? When you look at your smile in a mirror, do you notice any issues that you’d like to address? 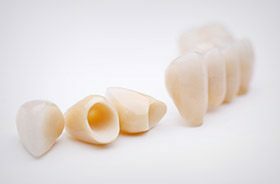 Porcelain veneers are a great way to give your smile a comprehensive makeover and save valuable time in the process! 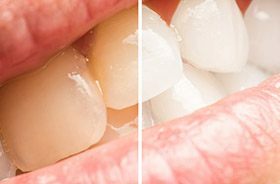 This style of restoration is crafted from a high-quality porcelain ceramic and designed to be extremely thin in nature – thin enough that it can fit over the visible surfaces of requested teeth in a very natural-looking way, hiding years of stains, chips, gaps, and more all at once. They’re also resistant against gradual staining, which means you should be able to enjoy your beautiful, brighter look for years. Sometimes, even the smallest dental imperfections can seem to catch your eye. If you’re irritated with a minor chip, crack, or gap between the teeth, talk to Dr. Stanko about the possibility of undergoing cosmetic bonding. 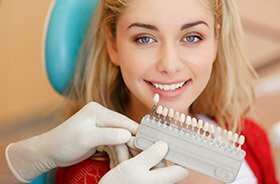 This procedure only requires a single appointment in most cases, which involves the application of composite resin (shaded precisely to match your existing tooth enamel) to the tooth or teeth in question, followed by some artistic sculpting of the material so that it blends in well with your smile. When a patient needs a new inlay, onlay, dental crown, or similar restoration, dark-colored metals don’t have to be the default any longer. Instead, First Line Dental offers all-ceramic materials that are high in quality and beautifully lifelike – they even reflect light in the same way as your original enamel. Better yet, they’re fully biocompatible and safe for all patients, even those who may have struggled in the past with allergies or painful sensitivity to traditional dental metals. A diet is heavy in coffee, wine, berries, and other staining food items. Certain medications can influence the appearance of teeth. Genetics are contributing to a darker dental shade. Old age is contributing to a darker dental shade. Whatever your specific circumstances, rest assured that it is possible to regain your smile’s confident glow. 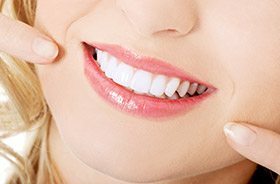 Our Manchester, CT dental office offers professional teeth whitening, which can improve the color of tooth enamel in a safe and dramatically beautiful fashion.